Analysis: After a pair of injury-plagued years, Watt bounced back in 2018 to something resembling his peak from earlier this decade. Overall, he posted his fourth-most sacks (16) in a given campaign while accumulating 61 tackles and a career-best seven forced fumbles in 16 games. Watt underwent a minor procedure on his knee following the Texans' wild-card loss to the Colts, but his offseason otherwise has been preparation-based rather than focused on rehab. 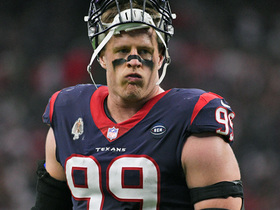 Watt underwent a successful minor knee procedure Thursday, Herbie Teope of NFL.com reports. Analysis: Watt played through a lingering knee injury for much of the 2018 season, and has elected to have a minor cleanup done to address the issue. The 29-year-old is not expected to be hindered during offseason workouts. Watt totaled 16 sacks on the year, which ranked second in the league, and is a Comeback Player of the Year candidate after having missed 11 games in 2017 due to a broken leg. 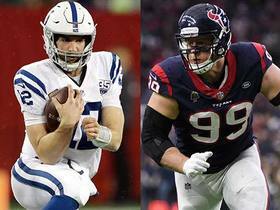 Watt had two tackles, a quarterback hit and two passes defensed in Saturday's 21-7 wild-card round loss to the Colts. Watt (elbow) doesn't sport an injury designation for Saturday's wild-card game against the Colts. Watt (elbow/knee) was a limited participant at Wednesday's practice, Aaron Wilson of the Houston Chronicle reports. Analysis: Watt's injuries are not believed to be too serious. He's still on track to play in Saturday's wild-card tilt with the Colts, but confirmation likely won't occur until later this week. The Texans appear to be taking every precaution necessary to ensure that Watt is available for Saturday's contest. Watt (elbow/knee) said Tuesday that he'll be ready to play in Saturday's wild-card playoff game against the Colts, Aaron Wilson of the Houston Chronicle reports. Analysis: Watt was limited in Tuesday's practice with elbow and knee injuries and wore a black sleeve on his right arm. He specifically downplayed the right elbow injury, while the knee is something he's managed since November. Watt (elbow/knee) was limited in practice Tuesday. 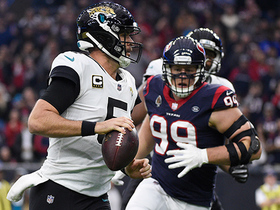 Analysis: Watt is nursing an elbow injury he suffered in Week 17's win over the Jaguars, in addition to the knee injury he dealt with over the past few weeks. The defensive end has played through the knee injury since November, and the elbow injury is not severe, so it's hard to believe he'll be sidelined Saturday. Watt injured his right arm during Sunday's 20-3 win over the Jaguars, Aaron Reiss of The Athletic reports. Analysis: Watt sustained an undisclosed injury to his left arm during a first quarter sack-fumble, saying, "My arm just got jacked up in a couple different directions." The star defensive end received X-rays on his left arm Sunday, which did not reveal any significant injury. Watt will undergo more testing in the coming days, but does not appear to be in danger of missing any time as the Texans head into the playoffs. Watt (knee) won't carry an injury designation for Sunday's game against the Jaguars. Analysis: Watt was once again a limited participant this week since he hasn't fully shaken his lingering knee issue, though it poses no threat to his status for Sunday's game. The 29-year-old has a prime matchup against Blake Bortles and a tattered Jaguars offensive line. Watt (knee) was a limited participant at Wednesday's practice. Analysis: Watt appearing on a Wednesday injury report has been common practice the last month, but he's yet to miss a game. 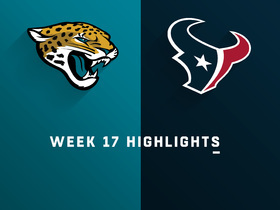 That's what we anticipate Week 17, when the Texans still have a shot at a playoff bye in the AFC with a win over the Jaguars and a Patriots loss to the Jets. Watt (knee) won't carry an injury designation into Sunday's game at Philadelphia. Analysis: Watt has been a consistent presence on the injury report with the knee issue but has yet miss a game this season. The 29-year-old has 14.5 sacks and six forced fumbles as the Texans face the defending-champion Eagles with backup quarterback Nick Foles under center. Watt was a limited participant at practice Wednesday due to a knee issue. Watt had six tackles (four solo), two sacks and forced a fumble that led to a touchdown in Saturday's 29-22 win over the Jets. He added two quarterback hits and two tackles for loss. Analysis: Watt managed elite production once again while being double-teamed all day. This was the fourth time he's recorded multiple sacks in a game, and since Week 3, there's been just two games in which he's failed to sack the quarterback. Watt (knee) does not have an injury designation heading into Saturday's tilt against the Jets. Analysis: Watt was limited in practice Tuesday and Wednesday before returning to full participation Thursday, so he'll be good to go Saturday at MetLife Stadium barring any pregame setbacks. The star defensive end will look to add to his season tally of 12.5 sacks. Watt (knee) recorded two tackles, both solo, a sack and a pass defensed across 63 snaps in Sunday's loss to the Colts. Analysis: Watt was limited early in the week as he continues to nurse a lingering knee injury. However, he hasn't been slowed down on Sundays, as he now has 12.5 sacks on the season -- tying him for third-highest total in the league. Watt (knee) was listed as a limited participant during Tuesday's walkthrough. Analysis: Watt has been dealing with a knee injury for nearly three weeks, though it has yet to keep him out of a game. Barring a setback, expect Watt to be his usual self against the Jets on Saturday. Watt had two tackles, a sack, two quarterback hits and one pass defensed in a 24-21 loss to the Colts in Week 14. Analysis: Watt had been on the injury list with a knee injury that had bothered him the last two weeks. He said he felt much better preparing for the Colts than he had the week prior, and it showed in his production. Watt now has 12.5 sacks, the fifth time he's reached double digits in his career. 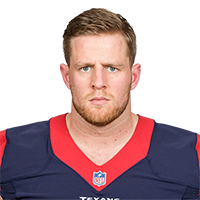 Watt (knee) doesn't have an injury designation for Sunday's game against the Colts, Aaron Wilson of the Houston Chronicle reports. Analysis: The knee injury might explain why Watt was limited to one tackle and no sacks in last week's 29-13 win over the Browns, but he was also listed with the same issue ahead of the Week 13 victory over the Titans and erupted for 1.5 sacks and nine tackles. His knee is probably less of a concern this week than the tricky matchup against an excellent offensive line. Of course, Watt did have two sacks and two forced fumbles in the first meeting between these teams Sept. 30. Watt said his knee is "doing well," Aaron Wilson of the Houston Chronicle reports. Watt (knee) was a limited participant in Wednesday's practice. Analysis: Watt was able to play through his lingering knee injury during Sunday's win over the Browns, which bodes well for his Week 14 availability. The star defensive end has yet to miss a game this season, but his participation in practice Thursday and Friday will warrant monitoring. Watt (knee) is active for Sunday's game against the Browns. Analysis: Watt is probably running at less than full health while managing the knee injury, but even a compromised version of the defensive end can still be a game-wrecking force. 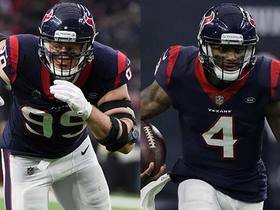 He proved as much in the Texans' Week 12 win over the Titans, when he recorded nine tackles and 1.5 sacks along with a forced fumble in the 34-17 triumph. Watt (knee), who is listed as questionable for Sunday's game against the Browns, is likely to play, Ian Rapoport of NFL Network reports. Analysis: The knee issue has been bothering Watt for nearly two weeks, but it doesn't appear to be anything that will prevent him from suiting up on gamedays or dramatically hinder his effectiveness. In fact, Watt turned in one of his best outings of the season in Monday's 34-17 win over the Texans, registering nine tackles, 1.5 sacks and a forced fumble. Watt (knee) is listed as questionable for Sunday's game against the Browns. Analysis: After playing through the knee injury in a Monday night win over the Titans in Week 12, Watt had less time than usual to gear up for this week's game. As a result, his practice reps were limited Wednesday through Friday while he continued to manage the injury, but the expectation is that Watt will be ready to go once gameday arrives. Watt didn't appear to have any limitations against Tennessee, as he racked up a season-high nine tackles to go with 1.5 sacks and a forced forced fumble. Watt, who spent multiple days on the injury report with a knee injury, had nine tackles, 1.5 sacks and a forced fumble in Monday's 34-17 win over the Titans. Analysis: Watt was removed from the injury report after a third day of limited participation, but it's clear Houston was managing his practice workload so that he could disrupt the Titans offense during a real game. He has sacks in four straight games and in eight of the last nine. Watt (knee) won't carry an injury designation into Monday's game against the Titans. Analysis: Watt was a limited participant for the third straight day Saturday as the Texans continue to manage his practice reps. Coach Bill O'Brien said Friday there were no concerns for Watt's playing status despite the practice limitations, and as expected he's now clear for Monday's divisional matchup against Tennessee. 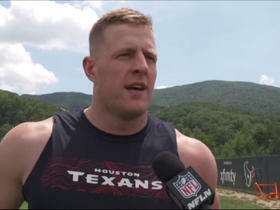 Coach Bill O'Brien said Friday that there are no concerns with Watt (knee) listed on the injury report, and added, "This was a plan going into the season," Deepi Sidhu of the Texans' official site reports. Analysis: Watt was limited in practice Thursday and, as evidenced by this news, the Texans are just trying to manage Watt's practice reps late in the season. Expect the Wisconsin product to be his normal disruptive self for the Texans on Monday night against the Titans. Watt was a limited participant at Thursday's practice due to a knee injury. Analysis: The Texans may be managing Watt late in the season, making sure they can get a full year out of him for the first time in three seasons. Watt has been a disruptive force for the Texans, hitting double-digit sacks for the fifth time in his career. Watt recorded four tackles (three solo), including a sack, in Sunday's win over the Redskins. Analysis: After two injury-plagued seasons, Watt has returned to his dominant pass rusher status. He's averaging a sack per game, though his tackle total is lower than in years past. 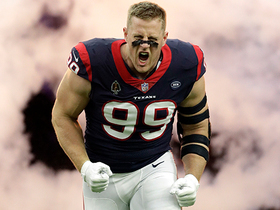 Watt will look to continue his great play into Week 12, when the Texans take on the Titans. Watt recorded two tackles and a sack during Sunday's 19-17 win over the Broncos. Analysis: Watt's sack total is now up to nine after bringing down Case Keenum. He's tied for third in that category behind Aaron Donald and Danielle Hunter. He'll look to get back at it after the Week 10 bye when the Texans face Alex Smith and the Redskins. 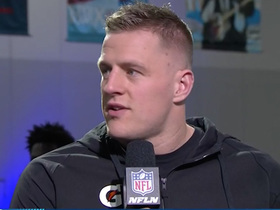 Houston Texans defensive end J.J. Watt joins "Super Bowl Live." 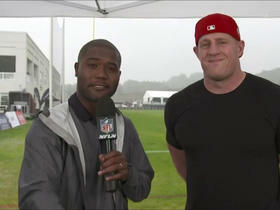 NFL Network's Ian Rapoport reports an update on Houston Texans' defensive end J.J. Watt's minor knee surgery. 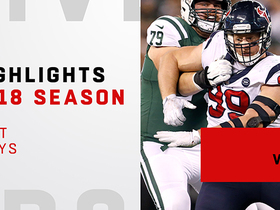 After two injury-plagued seasons, Texans defensive end J.J. Watt returned to form to lead the AFC with 16.0 sacks. Here is a look at his 2018 highlights.